Stop scoliosis from restricting you from participating in your favourite activities. Eliminate imposed barriers by increasing strength and mobility through properly performing simple exercises. Scoliosis is a lateral curvature of the spine or vertebral rotation. Scoliosis may result in neurological complications, arthritis, and lung and heart problems depending on its form and severity. Scoliosis is most frequently noticed in adolescence and is more common to appear in girls than boys (1). I am an Adult with Scoliosis. It is extremely rare for an adult to get scoliosis. Adults with scoliosis were most likely diagnosed in their youth and have either a mild case which required no surgical attention or had spinal fusion surgery. It is common for an individual with scoliosis to wear a brace. In adolescence, this brace provides support and stability and prevents long term curve progression. Once an individual has reached maturity, however, the brace only serves to reduce pain. In adulthood, it is unlikely for scoliosis to progress rapidly: only an approximate 10% show a significant progression (1). It is unusual for for individuals who undergo spinal fusion surgery on one or two segments of the spine to experience limitations in movement. 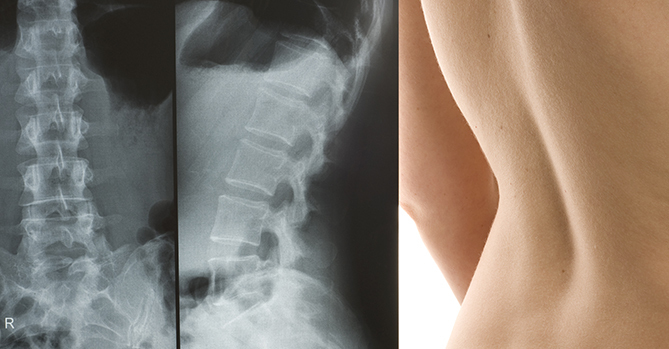 Mobility becomes compromised when more than two segments of the spine are included in the surgery. The motion of the lower back is inhibited and there is an increased amount of stress on other joints (2). To maintain your mobility, continue to participate in activities you enjoy. Strengthen the muscles surrounding the spine for support, and stretch and lengthen those imposing tension. The latissimus dorsi span the entire back. A row will work these muscles and create support for the trunk. There are many different ways to do a row using either a machine or free weights. It is important to choose the method that is challenging and well suited for you. Sit on a stability ball facing a pulley machine and complete a row. Do this exercise one side at a time. This will challenge your core and make the exercise more difficult. This exercise enhances full body conditioning with hip and spine rotation. Choose a medicine ball and hold it with both hands. Begin with feet hip-width apart with the ball away from your chest. Lower yourself into a squat, and be sure you are able to see your toes from this position. Align the ball to the outside of right knee, and keep your weight balanced between both feet while rotating your rib cage to the same right side. As you straighten your legs, lift the ball in a diagonal line while continuing to reach up and towards the left, lifting your right heel as you rotate your hips left. In the ending position, the ball should be outside of your left side and as high as you can lift it. Start with 5-10 repetitions using a stability ball. Repeat in the opposite direction. This exercise will increase range of motion and total body strength. Caution: Keep your chest lifted and spine long. Progress to more repetitions and heavier balls. Caution: Keep your chest lifted and spine long. Progress to more repetitions and heavier balls. These exercises help distinguish between spine extension/flexion and hip extension/flexion. They both strengthen your hips and spine. Start on your back with knees bent and feet flat on the floor.​ Hip Roll: Tilt your pelvis and lift each vertebrae off the ground until your body creates a straight line. Ensure your abdominal muscles are contracted for extra support and your neck remains straight and relaxed throughout the entire exercise. Roll down from your shoulders one vertebrae at a time. Bridge: Keep your spine still and use your hips to lift your back off the ground. In the bridge, there should be no articulation of the spine. Relax the buttocks as you lower down while maintaining the strong stability of your spine and deep core. Hint: Push your tailbone away from your head to lengthen the spine. ​Relieves tension in the the back. Start kneeling, push your hips back so that they are close to your heels while reaching your arms forward. Keep your child’s pose active by reaching your arms out in front of your body with hands flat on the floor.